Ordinarily, a dinner guest requires extensive, long-term planning. I bake a dessert a day or two in advance. I prepare my mise en place the night before. I always have an entree and a side (or two) and a platter of appetizers. Sometimes a fresh crusty loaf of bread from the farmer’s market, but this dinner caught me by surprise. I was preparing our weekday fare. It was nothing fancy. 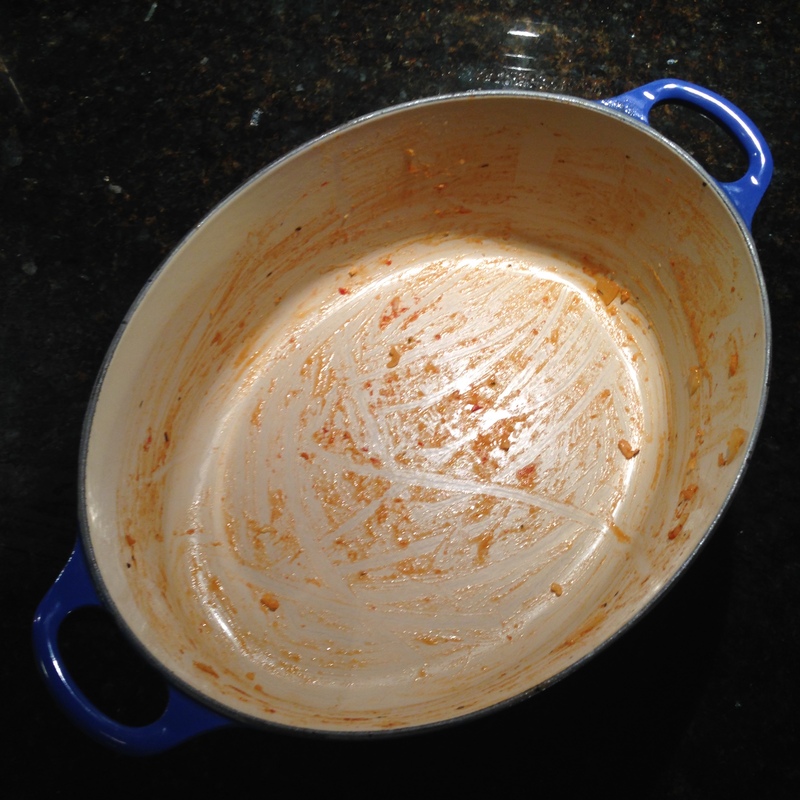 I didn’t even take a picture until we had scraped the pot clean. There were no green vegetables. Just a bowl of rice smothered in hot sauce and studded with spicy chorizo. For dessert, I could only offer a pint of Haagen-Dazs. And it was perfect, cozy and warm on a rainy night. We ate our ice cream out of mugs, curled up on the living room couches. A few days after our mini-reunion with Ali, Matt and I headed to the Maine coast to celebrate grandma’s 90th birthday with the rest of the Adler clan. There was a big party and a fancy meal on Saturday night, complete with a slideshow, stories of decades past, a candle-topped cake, and a concert from my uncle and cousin. It was a beautiful event, but so was the previous night, when a smaller group gathered for an informal dinner in grandma’s suite. My aunt Elaine had smoked some salmon and brought it with her from Boston, along with Tupperwares of vinaigrette and pesto for our salad greens and pasta respectively. She fried up some pot stickers, I boiled water for linguine, and we all ate happily around the dining table beside the fireplace. You could smell the ocean through the open door and hear the birds cooing quietly as the sun set. We kept grandma up well past her bedtime two nights in a row, drinking wine by the fireplace, sharing new stories, and remembering forgotten ones. It was a week of lovely reminders that the company we break bread with is far more important than all the bells and whistles of a fancy, formal meal. I am so grateful for these wonderful moments and wonderful people. Tags: casual, fall, one pot, rice | Permalink.